National – WIC and Medicaid WIC has used Medicaid participation to establish adjunct income eligibility since 1989. An individual is deemed adjunctively income eligible for participation in WIC if she or a qualifying family member (a pregnant woman or infant) is certified to receive Medicaid. Food and Nutrition Services (FNS). http://www.fns.usda.gov/wic/howtoapply/eligibilityrequirements.htm; and 42 U.S.C. 1786, section 17(d)(2)(A). and Medicaid Pilot project to test direct certification in NSLP through which children automatically qualify for free school lunches based on Medicaid findings of income at or below 133 percent FPL, without any new NSLP application from parents and without any other eligibility determination by NSLP. Six states implementing as of 2012-2013. Example of Illinois implementation: Nutrition and Wellness Programs Division, Illinois State Board of Education. Electronic Direct Certification with Medicaid Demonstration Pilot – SY2013-2014 Update. May 21, 2013. Florida – SNAP and Medicaid SNAP recipients are recertified at six month intervals. If income changes are reported at the time of the SNAP recertification and individuals are shown to qualify, a new 12-month Medicaid eligibility period begins. Kellenberg, Rebecca, Sharon Silow-Carroll, Eileen Ellis, Esther Reagan, and Jennifer Edwards, Health Management Associates, personal communication. Rhode Island The state is currently integrating its IT infrastructure for serving health and human services programs. The Henry J. Kaiser Family Foundation. State Exchange Profiles: Rhode Island. July 26, 2013. http://kff.org/health- reform/state-profile/state-exchange-profiles-rhode-island/. Massachusetts – Health Programs Hospitals, health centers, and other community partners help enroll children in the health program, using the online Virtual Gateway. The state both communicates with partners about new policies and receives feedback about emerging problems. As of FY 2010, more than 60 percent of successful applications were filed, not by consumers, but by these organizations acting on consumers’ behalf. 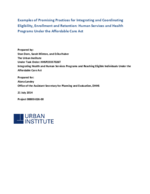 Kaiser Commission on Medicaid and the Uninsured. 2012. Secrets to Success: An Analysis of Four States at the Forefront of the Nation’s Gains in Children’s Health Coverage. http://www.kff.org/medicaid/upload/8273.pdf Commonwealth of Massachusetts. EOHHS Virtual Gateway: Health Insurance and Health Assistance Programs. September 2011. http://www.masshealthmtf.org/uploadedFiles/MassHealth_Training_Forum/Gate way%20Overview%209-8-2011.pdf.